Sidcup is situated on the south eastern side of the capital, within the London Borough of Bexley. A green and picturesque region, Sidcup offers a breathing space from the hustle and bustle of the city centre. 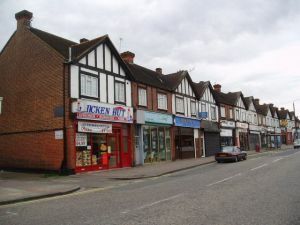 Large Edwardian properties, historic sites and outdoor areas such as Sidcup Gold Course make this a popular district. For those travelling by car the A20 provides access but there is public transport available too with the town’s train station designated as Zone 5. Carpet shop and underlay fitting in Sidcup, Kent. In Sidcup, Kent, there are several carpet shops that you can choose from for your carpet and underlay fitting needs. However, none of them will give you the quality and satisfaction that you can get from Cherry Carpets. Cherry Carpets is a carpet shop and underlay fitting company that will always put your best interests at heart. One feature that sets us apart is how we personally deliver our carpet shop to your home in Sidcup without you having to pay for anything. Choose from the samples we bring, and we will go right ahead to fit it for you. Your home will be transformed in an instant, and you will also benefit from our reasonable rates. Cherry Carpets is composed of professionals who will perform the task impeccably, so you won’t have to worry about gaps and overlaps in your carpets. Real wood and engineered wood fitting in Sidcup, Kent. Wooden flooring is a sure-fire way to make your home look more attractive and welcoming. Cherry Carpets also specialises in installing wooden floors in homes. We make use of the finest quality real wood and, since the members of our in-house team are very good at what they do, you are sure to be satisfied with the results. If you are afraid that real wood will set you back with a huge sum, you can opt for engineered wood instead. Cherry Carpets also provides this type of service, and you can be sure that the engineered wood we use are also of the best quality. Laminate flooring company in Sidcup, Kent. One common problem people have regarding certain types of floors is how they become a place where dust and other allergy-causing bacteria accumulate. One solution is to choose laminate flooring since their texture does not allow for dust to settle. If you decide to replace your floors with laminate flooring, call Cherry Carpets and we’ll be right there to do the job. We will provide premium quality and long-lasting laminate flooring and have them installed in your home in no time at all. Luxury vinyl tiles including Amtico, Karndean for sale and fitted in Sidcup, Kent. Amtico and Karndean are not the only luxury vinyl tile suppliers. When you hire Cherry Carpets for the task of laying out luxury vinyl tiles in your home, you will discover that there are also other, more affordable but just as high-quality, luxury vinyl tiles. Luxury vinyl tiles also require special attention during installation, and we at Cherry Carpets assure you that we will give it our 100%. The result is definitely going to be one that you will be greatly satisfied with. Vinyl flooring and linoleum fitting in Sidcup, Kent. Vinyl flooring is gaining popularity primarily because they provide comfort and convenience. If you want your home to be fitted with vinyl flooring, Cherry Carpets is the name you should call. Similarly, if you want linoleum flooring fitted in your home, you should also consider Cherry Carpets. Our linoleum is of top quality, made with linseed oil and other natural raw materials. They are sourced from the most trustworthy suppliers, so you know you won’t be wasting your money on linoleum of subpar quality. Custom and bespoke flooring company in Sidcup, Kent. Cherry Carpets is your obvious choice if you are looking for a company that provides custom and bespoke flooring. We welcome your thoughts and ideas on what you want for your home’s floor, and we will be glad to work closely with you to get the best bespoke flooring for your home. Your home deserves first-rate treatment and you will get that only from us at Cherry Carpets.